In his first overtly political work, jd holden has taken as his theme the demise of Spanair. 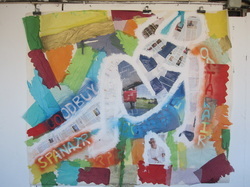 A cross between an art intervention, graffiti and demonstration, the work will be shown at Plaça d'Europa in L'Hospitalet on Sunday 24th June 2012. For background information on the demise of Spanair click here.